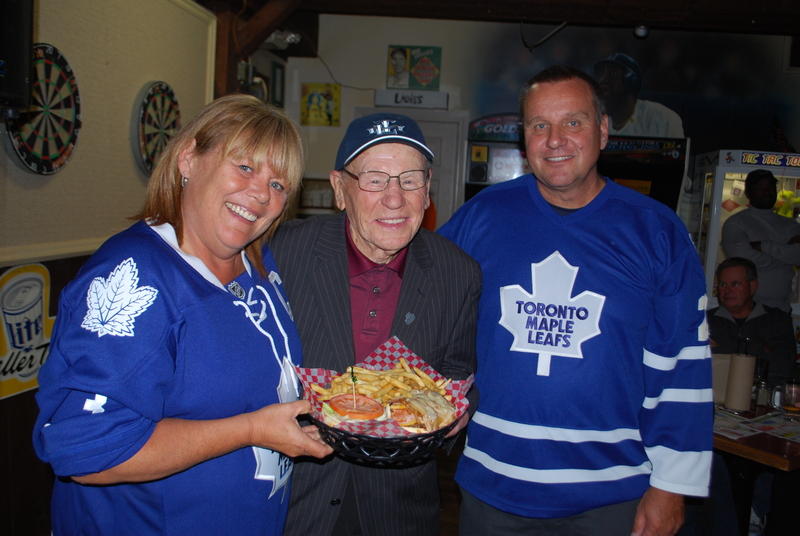 With a twinkle in his eye and an unmistakable grin, Toronto Maple Leafs great Johnny Bower dazzled a capacity crowd at Teddy’s Food, Fun & Spirits Tuesday Night. 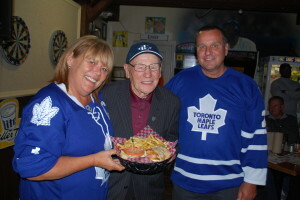 Teddy’s owners, Sandy, left, and Ted Jaskula presented Johnny with a burger named in his honour. Yes, he ate the whole thing. The burger is on sale until Friday with a portion of sales going to BBBS. As part of NewsNow’s Hockey Night In Grimsby event, which marked the official launch of Hat Trick Hockey and raised fund for Big Brothers Big Sisters, Johnny signed, hugged and chatted his way through three-plus hours of entertaining scores of local hockey fans. The Oct. 8 date marked the 60th anniversary of Bower’s first game in the NHL with New York Rangers, noted event emcee Mike Williscraft. The crowd also serenaded Bower a little in advance of his 89th birthday which will come Nov. 8. In all, with a 50/50, draws for some great prizes and photos donated by Bower and sold for $5 each, about $1,500 was raised for BBBS. “It could not have gone any better,” said BBBS executive director Lisa pare.